A hard-working apprentice from a Shropshire motor dealership has beaten off tough competition to take a prestigious national award. Tom Brookes is a commercial vehicle sales apprentice at the Furrows Transit Centre in Shrewsbury, and his dedication and commitment to the job have certainly paid off. 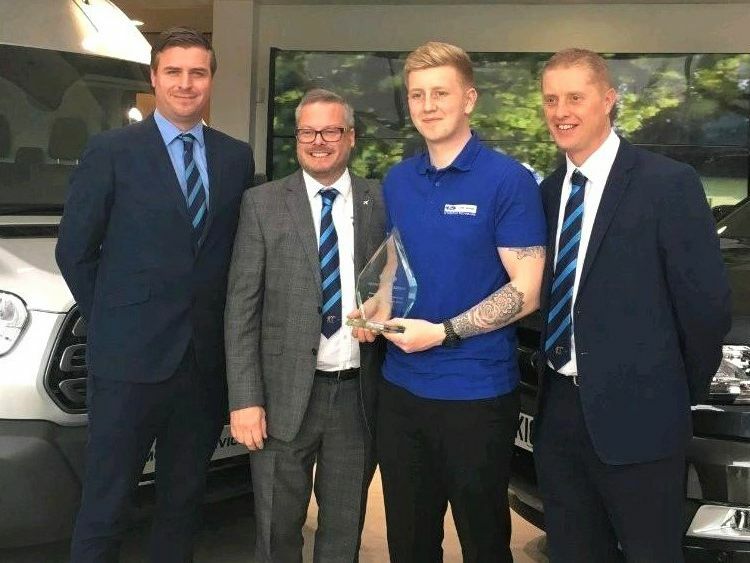 He has been named as the Business and Professional Apprentice of the year by Ford as part of their national apprenticeship programme, and received his award at the Henry Ford Academy in Daventry. “I’m absolutely delighted to have won the award – it was an honour just to be shortlisted in the final three, but to actually take the title is amazing,” said Tom. Tom has made excellent progress since beginning his training and is now responsible for all the transit centre’s online sales, managing stock, following up online leads, and dealing with customers on site. Transit centre sales manager Baz Hoare said: “Tom absolutely deserves this award as he has been a real star during his training with Skillsnet and Ford. It is well-known that the commercial vehicle industry is generally staffed by older employees, and we desperately need younger sales people to join the sector and make a career for themselves. Furrows managing director Dave Farthing said: “We’re so proud of Tom and his success is richly deserved. His win is a first for Furrows and he is setting standards that will be a tough act to follow for future apprentices.